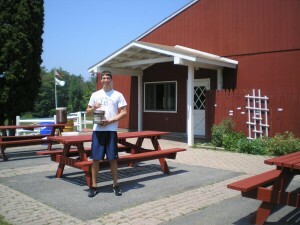 Eagle Scout candidate Zac Schrecengost stands near some of the 15 picnic tables he designed, constructed and painted for Camp Hollis. Campers and visitors will enjoy the outdoor furniture for years to come. TOWN OF OSWEGO — Oswego County children and their families have enjoyed the beautiful lakeshore setting at Camp Hollis since 1946. Now, thanks to an Oswego Eagle Scout, they have 15 brand new picnic tables upon which to enjoy their outdoor meals. Zac Schrecengost, a member of Boy Scout Troop No. 888, recently designed and built the outdoor furniture for his Eagle Scout project. Located on the Lake Ontario shoreline in the town of Oswego, Camp Hollis is a co-ed summer camp for children ages 8 to 14. Hundreds of children spend a week at the camp, which is owned by the County of Oswego and operated by the Oswego City-County Youth Bureau, every summer. Late last summer, Zac contacted the Youth Bureauâ€™s Senior Youth Services Specialist Jim Farfaglia, who oversees Camp Hollis, with the offer to perform his Eagle Scout project at the camp. Farfaglia noted that many of the campâ€™s picnic tables, which are used during meal times, activity periods and for relaxation by the lake, were in poor condition. He and Schrecengost agreed that making the new picnic tables would be an appropriate Eagle Scout project and would greatly help the camp. According to the Boy Scouts of America, an Eagle Scout award project must be of significant size that the Eagle candidate can not complete without help from others. Also, the scout must conference with the Eagle board to obtain approval before the project is started. â€œWhen I first started thinking about the project I thought that the planning part would be fairly easy and the execution of the plans would be the hard part,â€ said Schrecengost. â€œHowever, looking back on the project, the planning was more difficult than actually building the tables.â€ Farfaglia noted that he has overseen many Eagle Scout projects while in charge of Camp Hollis. Zacâ€™s was very well planned and executed. For more information about local Boy Scouts of America programs contact Steve Schrecengost at 343-2066. For more information about Camp Hollis visit Oswego Countyâ€™s Web site at www.oswegocounty.com/youth/hollis/index.html or call the Oswego City-County Youth Bureau at 349-3451 or 800-596-3200 ext. 3451.